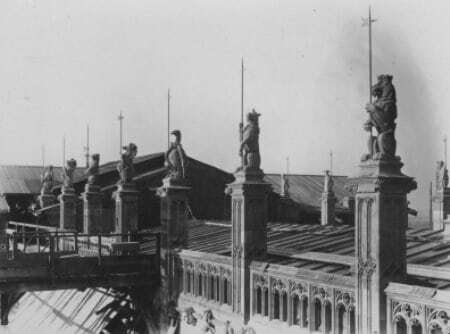 This photograph [SGC PH ROB.21/2] taken by Robert Burns Robertson, Chapter Surveyor, from the top of the Schorn Tower in 1925, shows part of the St George’s Chapel roof with the newly reinstated King’s Beasts adorning the parapets. Looking north-west across the Quire roof, the photograph also includes the temporary corrugated iron roofs over the Crossing and North and South Transept where restoration work, undertaken under the supervision of Sir Harold Brakspear between 1920 and 1930, was still in progress. The original carved stone royal beasts on the Chapel roof, which dated from the Tudor period, were removed in the seventeenth century on the instructions of Sir Christopher Wren, who found them decayed and dangerous when he undertook a survey of the Chapel in 1682. Recognising that some such weight on the parapets was necessary to maintain the stability of the roof, Wren recommended replacing them with stone pineapples, a decorative feature much in vogue at the time. However, for reasons of cost or aesthetics, this idea was not implemented by the Dean and Canons and the parapets remained unadorned for over two centuries. It was left to Sir Harold Brakspear to suggest that the King’s Beasts should be reinstated on structural grounds as part of his major restoration work on the Chapel. Fortunately a generous benefactor came forward to defray the full cost of the carving and installation of the beasts. The generous benefactor was Mr Frederick G. Minter of Putney, a successful London building contractor, who not only paid for the beasts, which were carved in his own building yard, but also contributed an additional £4,000 to the Chapel Restoration Fund. When, sadly, he died in 1927, the financing and implementation of the project was continued by his son, Sir Frederick A. Minter, who took up the role with enthusiasm and subsequently also helped to finance the rebuilding and enlargement of St George’s School in the 1930s. Seventy six new beasts, of fourteen different types, were commissioned and were installed at Windsor in several phases, from 1925 to about 1928, in sequence with the repair of the separate sections of the roof. They were carved in a Tudor style by sculptor Joseph Armitage at Minter’s building yard in Putney following Brakspear’s designs. These, which were to some extent based on the surviving Tudor royal beasts at Hampton Court, had been approved by the Garter King of Arms in 1923. The final result of the reinstatement of the King’s Beasts, which can be seen today, is stunning. Forty-two beasts adorn the upper tier holding flags (some installed with lightening conductors); whilst the remaining thirty-four, in the lower tier, support carved heraldic shields. The sculptures, each 4 feet 6 inches high, include the crowned lion of England, the unicorn and falcon of Edward III, the swan and antelope of Bohun, the panther of Henry VI, the Beaufort yale, the white hart and falcon of Richard II, the white hind of Edward V, the dragon of Henry VII, the lion of Mortimer and the Neville greyhound. Those on the north side represent the House of York, whilst those on the south side are Lancastrian, the inclusion of both emphasising the union of the rival families by the marriage of Henry Tudor with Elizabeth of York. ‘The restoration of the “King’s Beasts”, bringing back to the Chapel of Windsor a strange echo of the Tudor Dynasty, is an interesting and important achievement which will be praised by all who love the story of an earlier, picturesque, romantic England….. So, when King and Commoner pass the mellow building, they will be able to look up to the lofty pinnacles and see, among other symbols of the rich yesterdays, the fantastic Panther of Henry VI, the Red Dragon of Henry VII, the Black Bull of Clarence, and the White Lion of March. Seeing them they will recall the history and traditions of the vanished years that whisper in the mind and heart and sing anew their brave and passionate song’.